Title: So, You Think You're A Celebrity...Chef? At a Gourmet Food Festival, in Ireland, where anything goes! When media agent Hilary Hargreaves travels to Ireland to look at a campaign for a new cookery school, she meets a blast from her past - the romantic but feckless chef Mickey Lloyd, who is hell-bent on resurrecting his flagging career. Her tough demeanour is rocked as it becomes apparent Mickey's intentions involve more than a stint behind a stove in his quest to pursue her. But as plans for the school gain momentum, she realises that she's developing more than a passing interest in reformed alcoholic Long Tom Hendry, who owns the crumbling old mansion where the school will be homed. Hilary has many ingredients to juggle with her demanding client list - which looks set to boil over if she doesn't keep control. From London's bustling Soho, to Southern Ireland and the sunny shores of the Caribbean, has Hilary got too much on her plate and is she really prepared to risk it all for love? 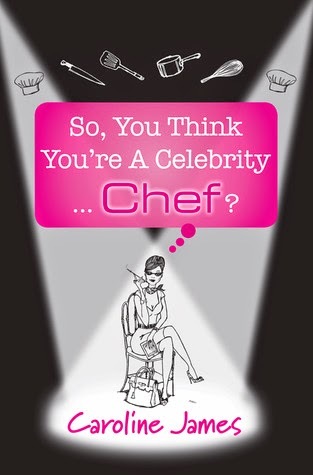 Review: So You Think You're A Celebrity...Chef? is a fun read that will make you laugh more than once. In the story there are quite a lot of characters, which was a bit confusing at the beginning but once they all start playing their part and you see they are all linked, it gets better. The main character, Hilary, is an agent for famous chefs, the ones that appear on TV all the time and publish books. I didn't really warm to her, especially when the story starts, as she is a bit too bossy with her employees and bitchy in general. As the story unfolds though, we get to see her let her hair down and enjoy life more. As you can imagine the story revolves around food. So if you enjoy foody stories and especially all these TV shows like Master Chef where there are more divas than real chefs, I am sure you'll find this story interesting. And the added travelling, makes for a good escapist story. Who wouldn't want to get lost in Ireland or the Caribbean with a bunch of chefs to cook for you? All in all, So You Think You're A Celebrity...Chef? is a light read to enjoy one springy afternoon. It has its humorous moments and a kind of Soap Opera air, with lots of characters, misunderstanding, scams and love affairs and with more than one surprise in story for you. So if this sounds like your kind of meal, go for it!